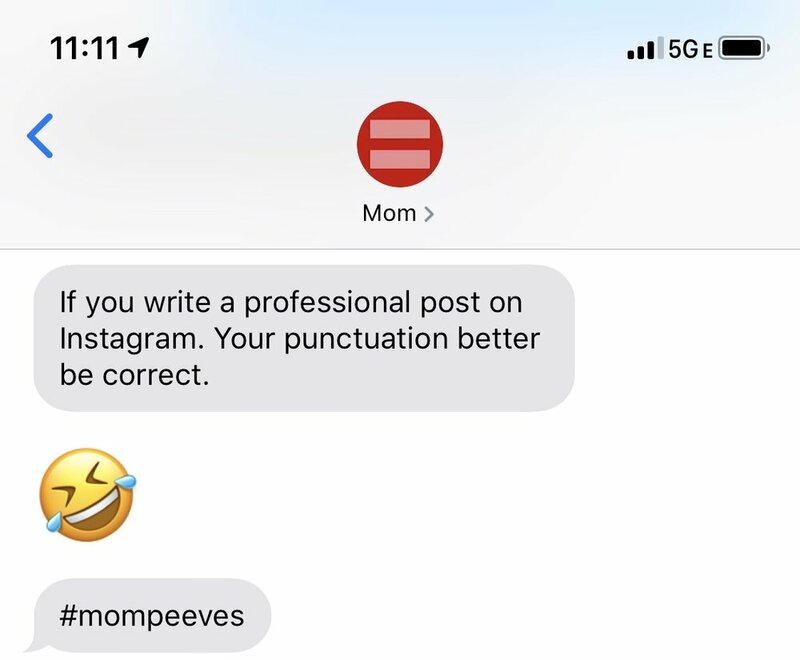 On Mondays I’ll post a bit of Audition Advice or an Audition Peeve on Instagram and Twitter, then on Wednesdays I’ll write a quick blog to further explain what my advice or peeve is about. 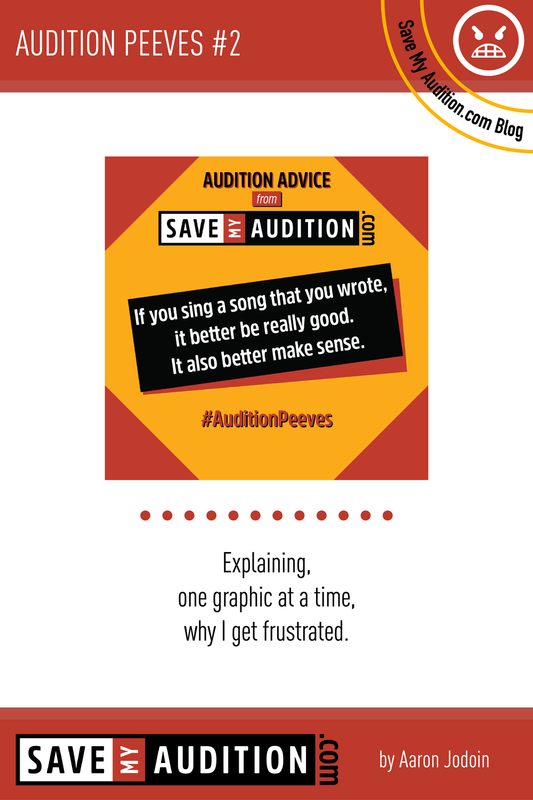 Be sure to follow Save My Audition on Facebook, Twitter and Instagram! There are buttons at the top of this page to find those social media accounts. This week we jump a little into giving the wrong feel for your song. If there’s a better way to SABOTAGE your own audition… I don’t know what it is. Let me first say that I LOVE when people walk into the room and sing a song that they wrote. Honestly, I love it. It’s not easy to put yourself out there in that way and I have respect for anyone that is willing to do it. With that being said… Writing songs is hard. Writing good songs is even harder. 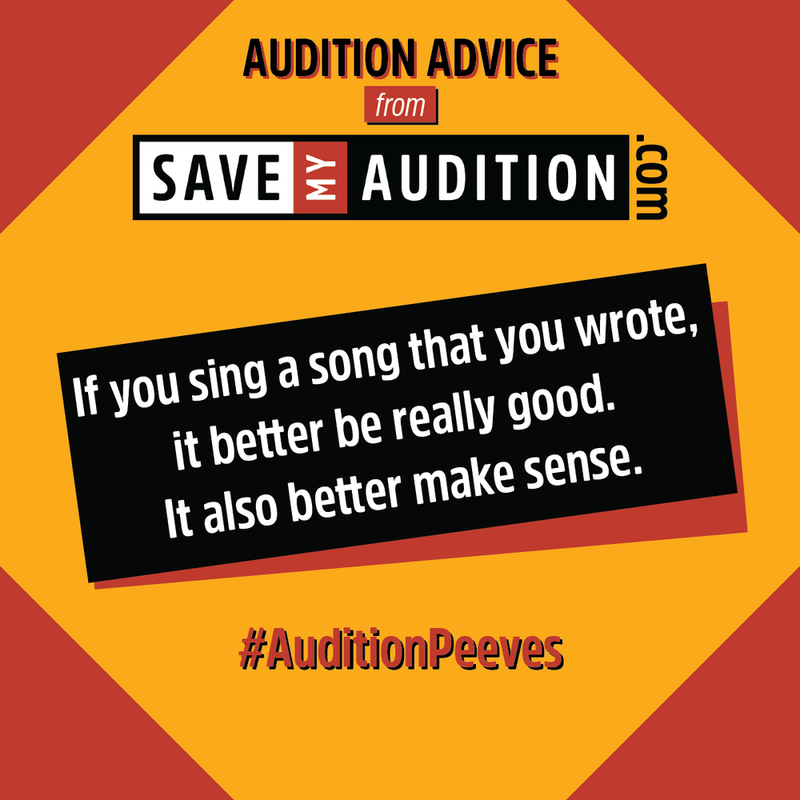 Writing good songs that make sense and work in an audition room is even harder than that. I’ve heard countless original songs in the room, including some incredibly creative stuff, but sometimes a song walks in that’s a clunker. I’m not trying to judge the work and time people put into writing a new song. But what I will say is, please, for your sake, when you sing a song that you wrote make sure it’s a song that is appropriate to the audition you are walking in to. It’s hard to hear new songs in the room. We can easily get distracted trying to figure out what the song is about and we stop paying attention to you as a performer. It’s a delicate balance. Continue to write new songs, continue to perform them, but know that the audition room isn’t always the best place for your songs.